All good things apparently come to an end and the end brings out all the cliches in the book. The hero drives off into the sunset, or everybody dies and Horatio stands there pondering about all the things not dreamt of in philosophies. In keeping with that tradition, "So long and thanks for all the cake." Music always has this uncanny ability to transcend barriers and form bridges even in the most unexpected of places. But rarely do you see the souls behind the music transcend the music itself. Pandit Ravi Shankar was one such rare man. The world renowned sitar player passed away on December 11 having broken so many barriers around the world with his beautiful music. 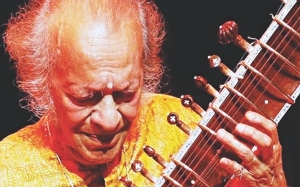 Ravi Shankar travelled through Europe at a very early age and his exposure to western genres such as jazz later lead to his later collaborations with them. His complete list of achievements with the sitar is astounding and would fill volumes. Suffice to say he is universally considered as a pioneer of Indian music and the supreme medium connecting the music in our part of the world with that of distant lands. He breathed his last as he lived; charming hearts to the very end as even at the age of 92 he was nominated for yet another Grammy. And his persona outside of music only adds to his status of immortality. 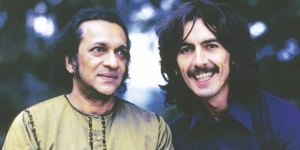 Ravi Shankar will always hold a special place in the hearts of millions of Bangladeshis for organizing The Concert For Bangladesh with George Harrison. The country will forever be indebted to him and other great musicians for coming to our aid during our struggle for liberation. As a colleague sums it up perfectly by saying, "Ravi Shankar may have been one of our own by virtue of his Indian subcontinental birth, but he was one of the last to inspire on a global scale. Although most of us probably can't understand why Westerners are so fascinated with Indian mysticism and traditional music, The Beatles saw something valuable and were inspired in their own ways.” Words will invariably fall short when describing this great man so we ask you to join us in remembering him, not through mourning, but through a celebration of his music. Are you happy now, Mayans? If there's anything you should take away from this soon-to-end world, it's that you don't want to mess with old people. 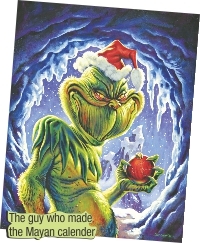 Especially Santa. You do not want to cross that dude. But seeing how the Mayans and Roland Emmerich conspired to effectively leave him an unemployed old man (without pensions, I might add) living in the North Pole for no good reason now, he'll be more than a little angry. The most important question you need to ask yourself is this, should you be Christmas shopping or Doomsday-prepping right now? You could decorate your house with a Christmas tree and mistletoes but it's not going to help much when the Earth starts heaving. And imagine meeting a zombie under a mistletoe. Awkward. No, the best thing for you to do right now is to huddle in your bunker - or under your bed if you were stupid enough to not have one made - and hope the apocalypse passes by without noticing you. Which brings us back to the Santa conundrum. He won't have the pleasure of bossing around a few underpaid elves or bring out that awesome reindeer sleigh or even creep into your house unnoticed at the dead of the night. Christmas just got cancelled and it isn't a good feeling. Are you happy now, Mayans? In the work we do, we basically have no base. The fragile minded misinterprets this as baseless; the smarter ones understand it's about a physical location. We have our meetings in all sorts of places, our collateral crowd ranging from beggars to businessmen. On one such occasion in the middle of a park, while the temperature of our discussion was proportionately increasing with the number of mosquito bites, the genius amongst us took out his smartphone and switched on the anti-mosquito app. It took us 33 seconds to grasp the situation and the next 33 minutes were spent rolling on the grass, laughing. An anti-mosquito app, really? At that time and place, I realised the world had lost its mind. The truth however is more forgiving than 20-years olds are to the genius amongst them. Technology has essentially created a window of opportunities for those lacking a generous bank account, and more often than not, is the fastest way to that generous back account. In the development sector, technology is a powerful tool, when combined with years of research and strategy planning, can truly be the cutting-edge solution to some of the world's most pressing issues. The Khan Academy's online tutorials on maths and science, ODesk's outsourcing opportunities, Facebook's reach in replacing adda and revolutionising how we communicate with each other and so on, are advents of how overpowering technology is in our lives today. The simple mobile apps that let us spy on our exes (Google Latitude) or enjoy a ride in space with our current beloved (Google Sky) have redefined our meagre, earthly experiences. We are at the edge of a global revolution that no longer requires PhD degrees or bank loans, and can just as well be conquered using a computer, a working internet connection and an ample dose of intelligence. To many of our surprises, Bangladeshis are quite high up on the list of technological advancements. Local talents have developed apps that let us type in Bangla across platforms, ChondroBots that can excavate and mine on the moon's surface and web portals that takes tourism to the next level. What better time than now to reach out, to create, to be a tech superstar? And on that note, we're excited to introduce the Startup Weekend in Dhaka. The Startup Weekend is a global grassroots movement that connects designers, developers, entrepreneurs and just about anyone with inspiration through a 54 hour competition to pitch, design, code and develop their ideas. The movement is globally supported by Kauffman Foundation, Google and Microsoft Bizpark. Dhaka's first Startup Weekend will be held between 10 to 12 January 2013 at Independent University Bangladesh. The local partners are One Degree Initiative Foundation, Independent University Bangladesh, The Daily Star, Payza Bangladesh (Casada Technologies), Green and Red Technologies, One Stop Commerce and NewsCred. If you think you've got what it takes to compete and create, register at dhaka.startupweekend.org before 25 December 2012. FYI, the secret to creating is having just the right amount of inspiration and courage to go out and do it. The beautiful sunny afternoon of Victory Day reigns outside while we compile your conversations. Yes, we are regular Voltaire-followers, ensuring that your voice is heard. Proud of our nation's glorious history. Ashamed by our disastrous political entities! Moved by Mastura Tasnim's "Children of Blood Fear & Victory." Aww! Aupshori wrote a letter to the PM... PMs don't read Rising Stars. It would be a 35,000+ power voltage if PMs would actually read any newspaper! The Rising Stars We printed it not because the PM might/would read it. It's because a certain kid has hopes and RS didn't want to disappoint the kid. Even though those hopes may be dashed, it's always better to hope and try. I don't understand why young people who read think being random for the sake of being random is "cool". You guys should really do an article on that. Being random because you're a scatterbrain is one thing, but this is just sad. Ahmad Ibrahim What exactly do you mean by being 'random' here? Sababa Shahid You know what would be greaaaaaaaat? A QUAFFLE SHAPED WAFFLE! Mastura Tasnim I dunno, I find the idea of a quaffle shaped waffle quite intriguing. Muzoora Epaphrus Love you all! Pictures tell a million words these days. That's why comics are so amazing. 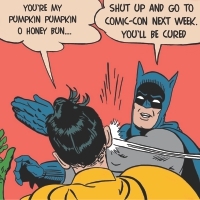 A proper full fledged Comic-Con is taking place on the 28th and 29th December. There's going to be tons of action figures and new books unveiled. Artists will be there to wow you with their skills at caricatures and comic illustrations… on the spot. Our totally local and awesome comic satire magazine Unmad will be there in full force. Jamil's Comics is giving away 5000 comics on a first come first served basis. Your friendly neighbourhood RS will also show up. And a lot more. Be there or be left out.